Thank you again to you and the staff at Guisachan House. My husband and I were married there on September 10, 2016. 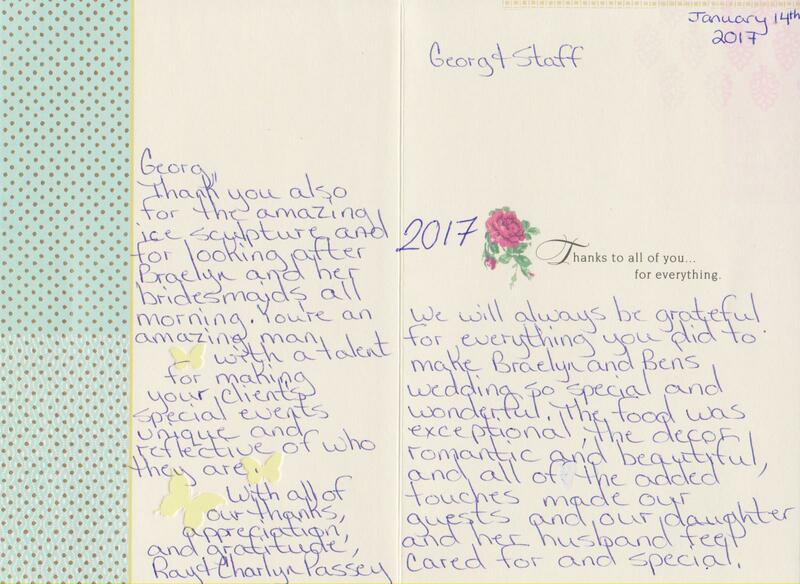 We can’t say enough good things about George and the staff. The decor, food and service was a firm 10 out of 10. I (the bride) got ready at the house with my bridal party; George went above an beyond to look after the bridal party while getting ready. Every detail was taken care of… the bride and groom had no worries! Everyone at our wedding had a great time. Highly recommend the Guisachan House! I had a lovely time at Guisachan House Restaurant during my recent trip to Kelowna. The environment and service is exceptional and creates a beautiful ambiance to fully appreciate the remarkable talent of its Chef. Thank you so much for a wonderful dinner and for providing me with a copy of Niche magazine. It was great to read that in addition to being a beautiful location with fine cuisine, Guisachan Heritage Park offers up British Columbian history and hospitality to guests both local and from around the world. I am so sorry this comes late. We had such a wonderful day thumbs to you and your staff. Thank you for making Rebecca's wedding a joyous celebration. Everything was exquisite. Many thanks. Thank you so much for making our day the best ever! Your calming influence and meticulous attention to detail made our wedding perfect. Everyone commented on how efficient your staff was and how they had never tasted better food! Thanks again. Brent and ! would like to thank you again for making our wedding day so beautiful! Thank you doesn’t seem to be enough for everything you did to make my wedding day stress free and totally amazing. If anyone ever wants to talk to us about your service and your amazing gardens. Please give our name. Once again Thank you to you and your incredible staff. Thank you very much for all your help to make our wedding day perfect. We couldn’t have done it without you all. All of our guests had a great time and so did we because we didn’t have to worry or stress about anything! Many thanks for all your help in planning and pulling off a perfect wedding for us. Everything was perfect from the food to the service! You are amazing! We are sending a heartfelt Thank you to you and your staff for creating such a beautiful backdrop and warm, inviting atmosphere for our family and friends on our wedding day. The extra touch of beverages, tables and chairs brought outside to guests waiting for photos to finish was very thoughtful and greatly appreciated. We were impressed by the professionalism and class treatment our guests and ourselves received from you and your staff. I can also understand why you win awards for your food! We will recommend Guisachan House to everyone for their storybook wedding. We both want to thank you for making our wedding so beautiful. The setting was so romantic, the food was incredible, the cake was gorgeous, the flowers beautiful and the service was second-to- none. We’ll send you some pictures and look forward to dropping by again this summer! Thank you for your efforts and your support during our wedding. It was a beautiful ceremony and the food and the diner was wonderful. Your hard work made it possible for us to spend our time and energy enjoying the ceremony. We are most grateful to you and we hope we will see you again in the future. Thank you so much for making our wedding day on August 31st 2002 so beautiful and special. We couldn’t have asked for a better day and you and your staff thought of anything and everything that was needed to add that extra touch. All of our guests were very impressed as were we. I wanted to personally write and thank you for sharing your time, gifts and talents with my fiance and I. It was our pleasure to have you be apart of the most special night of our life. I was so impressed to see how you went out of your way to ensure Jen and I had the best time possible. Thank you so much for being willing to help us. It was amazing! Thanks again for your assistance in making Pihl & Associates open house a success. The menu and services provided was excellent! Thank you so much for all your hard work. You and your staff did a great job! Everyone truly enjoyed the gardens. The food and the atmosphere. You all really made the day special for us all. Keep up the great work and we’ll visit when we’re back in Kelowna. Jeff and I would like to thank you so much for the hard work you all put into making our wedding day so special. I know it must have been a long, hot, wet and tiresome day and evening, but you made everything look and taste so beautiful. We’ve had many compliments from our guests! We wish to thank you for the superb dinner you prepared for our anniversary. The clam chowder was especially delicious, and as many remarked, the dessert was as exquisite as it looked! The whole meal was so tasty and good. Thank you too, for the table arrangement with the roses and the candles. Beautiful! Thanks for an excellent meal, delightful surroundings and pleasant service! Thank you very much for all your kindness. You really did a great job, the service, food and everything was gorgeous. If we would get married again, without hesitation, we will go with you. How can we begin to thank you for your kindness, generosity and help in so many ways? You made our wedding day so very special and one our friends and we will remember forever. The food was wonderful, as was the service and it was such a treat for me to be able to make my walk down the isle in such a romantic setting. We named our ice sculpture “Angel George” in your honour. Thank you especially for the fabulous “diabetic cake” it was incredible. You have made out dreams come true! Thank you for making our wedding such a memorable evening. The setting was beautiful. We are still talking about the dinner. It was perfect, you really did a wonderful job. We really appreciate the beautiful wedding reception you made for our daughter Shelley Wilhelm. Everything was perfect and we received many compliments on the whole reception. Thank you so much for making it a special day. We want to thank you for all your hard work, time and effort you put into making our Wedding Day and Rehearsal Party so special. I can’t even begin to thank you for all the many ways you made our Wedding so special: beautiful cookies, amazing dinner, stunning wedding cake, etc. All of our guests were so amazed with your entire service package: so were we. We thank you from the bottom of our hearts for everything you did to make everything so special. We really enjoyed our time spent with you in deciding our dinner and layout for the Wedding Day. Without your knowledge and expertise our day would not have been really as amazing nor as perfect. We look forward to seeing you again soon. Thank you so much! Thank you so much for everything you did to make our day special for us. The food, service and presentation was absolutely beautiful, you went above & beyond for us and we appreciate it. Thank you for the lovely photo album. 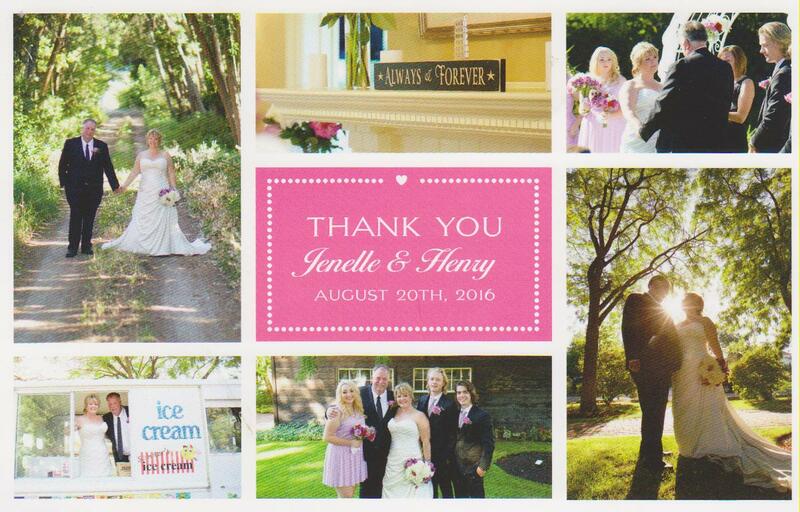 We just wanted to thank you & your staff for all your work in making your wedding reception such a wonderful success. We have heard nothing but rave reviews on how beautiful the gardens and restaurant were, how delicious the dinner and cake were, and how wonderful the service was. The only complaint we had was that people didn’t bring enough film for their camera! Thank you for everything. Thank you so much for creating such a beautiful setting for our wedding. Everything was so well organized and dinner was spectacular (we had many comments from our guests). We had a wonderful time! Just a short note to say thank you for making our day so special. We would also like to thank you for the champagne & wedding album. We will have a picture for you next month. Thank you so much for making our wedding day so special. You did it all. We appreciate your kindness in allowing us to have the larger room. The dinner was wonderful. We had a lot of compliments! The service was outstanding. Thank you to the staff that made this day so perfect. We love the photo album. 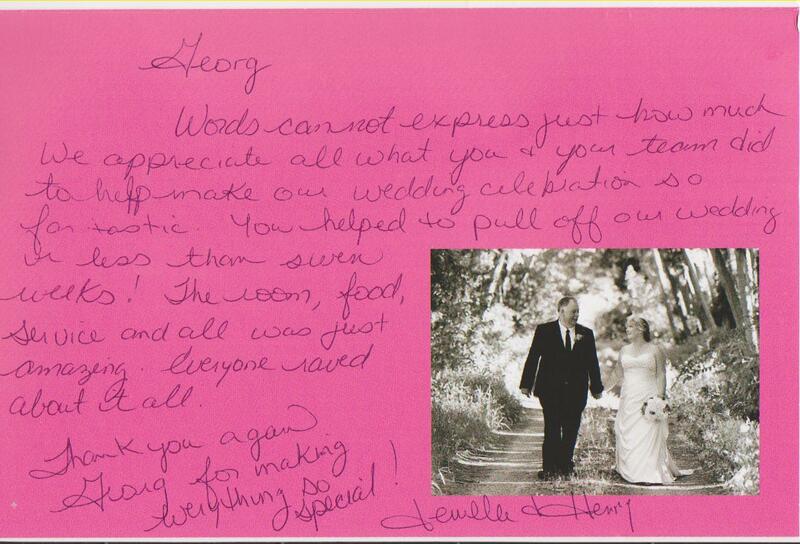 A note to thank you for the lovely dinner you catered four our 50th wedding anniversary. The cake was beautiful and all appointments excellent, with very good service. The album will soon be filled with Guisachan pictures. Thank you for making our reception such a special occasion. Your attentions to detail, and superb culinary skills have greatly impressed us.